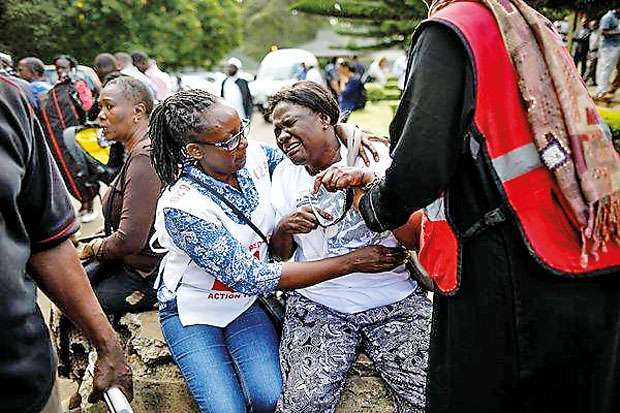 DPA, 16th JANUARY, 2019- All the terrorists involved in an attack on a hotel in Nairobi have been killed, Kenyan President Uhuru Kenyatta said on Wednesday, while 14 “innocent” people have died. “I can now confirm that as of about one hour ago the security operation at Dusit complex is over and all the terrorists eliminated,” Kenyatta said on television at about 10:30 am (0730 GMT), referring to the upmarket hotel. “As of this moment we have confirmation that 14 innocent lives were lost through the hands of these murderous terrorists with other injured,” he added. There were reports circling online of foreigners among the dead, but Kenyatta gave no details. The attack started with a suicide bombing on Tuesday afternoon and went on into the early hours of Wednesday morning. Somali-based jihadist group al-Shabaab claimed has responsibility for the assault.